The Mobius 5-Bay Thunderbolt 2 Enclosure is designed to meet the needs of power users with the most demanding storage requirements. The removable trays are designed for 3.5" or 2.5" HDD/SSD and allow for easy installation - simply slide the handle to insert or withdraw the drives. The Mobius provides two Thunderbolt 2 ports for daisy-chaining with other Thunderbolt devices, including displays and external drives.The thermally efficient aluminum maintains optimal drive operating temperature, prolonging the life of the drives. Airflow is maximized due to the high-quality fan that exhausts air away from the internal drives. 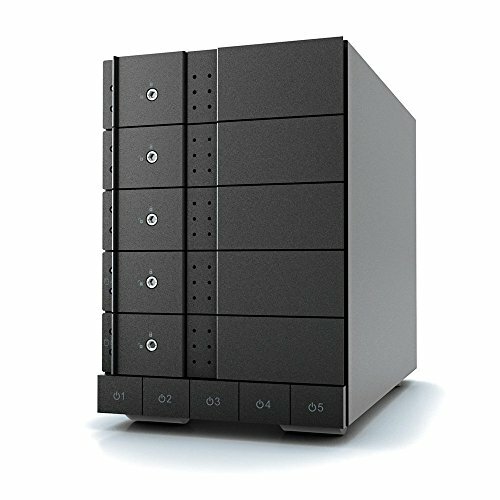 The Mobius 5-bay Thunderbolt 2 is backed by an Oyen Digital 2-year warranty and includes free lifetime technical support. Five removable trays for easy SSD and/or HDD installation (3.5-inch or 2.5-inch SATA). LEDs for power, drive activity and connection status. Independent power buttons for each drive allows drives to be powered off individually. Dissipates heat efficiently with aluminum housing & quiet fan. Non-RAID system, five independent drives.